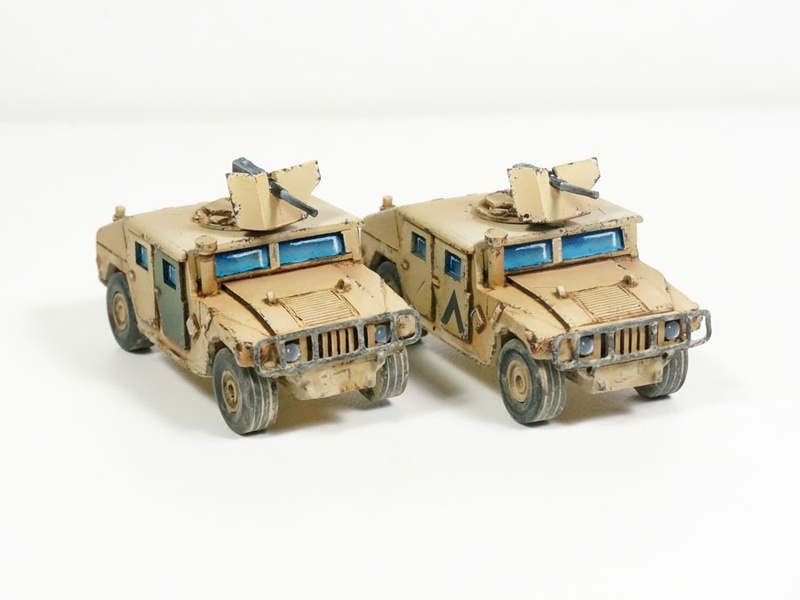 Today I’ve finished two little US Humvees from Irishserb. 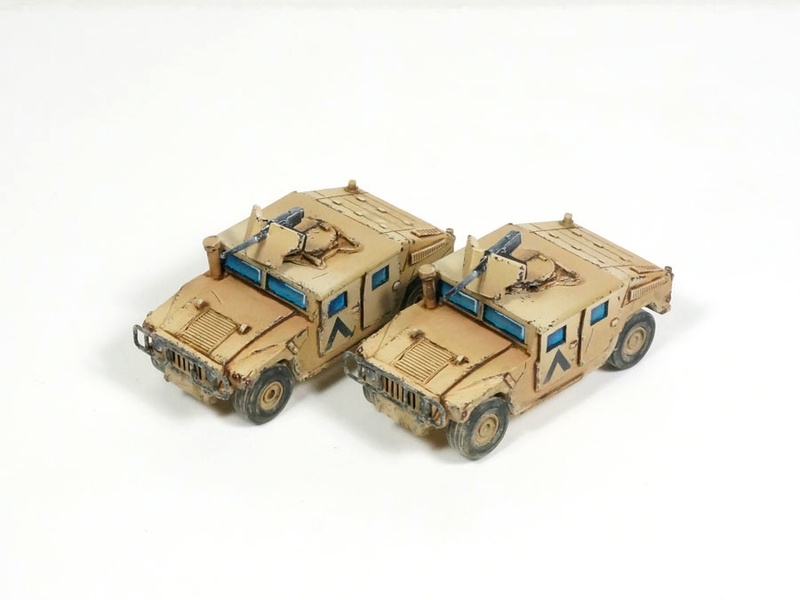 They came with hatch and .50 cal machineguns. What gorgeous minis! The models were a gift from Rubén, thanks for them! They’re resin, handmade with good detail and manufacturing. You can see more models in his web: Irishserb. They doesn’t have any mold lines and only some green stuff is needed in very few points. Nice and cheap!! Totally recommended. The base color is Tamiya XF-78 Wooden Deck Tan. For the highlight, I mix it with pure white, again from Tamiya. When I finished the modulation, I found that the color was a little pale, so I made a filter: Tamiya XF-59 Desert Yellow mixed in a proportion of 1 part paint 5 parts alcohol (1:5). I applied it with an airbrush in very thin layers (2 of them). With that, the base color gain a more yellowish color, making the model more ‘real’ without removing the underlying paint. It’s VERY important to dilute the paint of this filter in a great proportion (1:5 minimum), so we don’t cover the earlier highlight work wich has take us so much time!! The detail of the green door was an idea of Pecadolr, a friend from the forum. Thanks for it Ricardo! It adds a nice color touch to the vehicles. It represents a spare part not available in the original desert color. The triangle mark was done with a Tamiya masking tape, cut to shape. The front metal protection bars were done by scratch with electronic cables. Hola Iván! Gracias por tu comentario! La idea de la puerta fue de Ricardo, del foro. A él todos los créditos! !